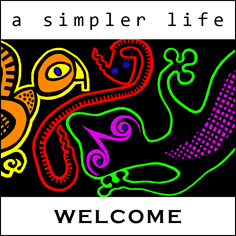 Hi, and welcome to my site about simple living, or how to become more self-sufficient, less dependent on money/ having a job. Based on many years of practical experience, good and bad. With stuff like: how to believe in yourself (not get sucked into the allure of quick-fix faiths and isms)/ avoid the need for a huge income or job/ take back the responsibility for your own health/ make & grow as much for yourself as possible/ and above all do it in a way which puts the planet first, which means not taking any more out (like everyone else) but putting back, ie acting sustainably. What this site isn’t, is any kind of manifesto or life coaching. Either for others to follow, or feel they have to comment upon, especially negatively, so please remember that. Nor am I claiming to be an expert on anything, this is just what I’ve picked up along the way over 25+ years of treading the path and thought others would find useful (especially the mistakes). It’s been a hard and often very isolating way of life, going totally against what everyone else believes in so whole-heartedly, so it is good to know there are others out there doing the same thing. Until October 2013, we were Maureen and Phil Rooksby. Originally from South London, where in the mid 1970s we started out as freshly-minted (art) teachers. A choice based on disappointing A level results (neither of us was any good at exams) and the shared fear that otherwise we’d have to spend the rest of our lives in low-paid/ boring jobs and not much in the way of holidays/ free time. We secretly hoped that being art teachers would provide the opportunity to satisfy our developing creative appetites while getting paid for it. It was a big mistake, but did pave the way into another kind of career, one we had previously not been aware of and a lot more exciting and rewarding. The alternative world of community arts, which had just begun around that time. Taking us from London to Milton Keynes (during its formative years), then to North Yorkshire. By 1986 Maureen was busy setting Leeds on fire with community arts at the West Yorkshire Playhouse, and I began to put some ideas together for making our home and one acre garden more self-sufficient. Then in 2000 we made a life-changing decision. To sell the house, give up working and live in a van. An epic nine-year odyssey, in which we searched for meaning of life/ our own creativity, and the one place on earth perfect enough to have everything we ever wanted. The journey is best left for Maureen to describe, in her book: TREAD SOFTLY BECAUSE YOU TREAD ON MY DREAMS. Available free (as a download) simply by clicking here. Also highly recommended are her blogs, now available in a single book entitled MUSINGS ON A MORE SIMPLE LIFE. Available free (as a download) simply by clicking here. – somewhere we would be able to live without debt. No mortgage/ rent/ utility bills/ or any other charge on our time, and with all the natural resources not only to build a home, but provide our food/ fuel/ other building materials/ electricity/ medicine/ plus earn cash when necessary. – our own water supply. Originally we wanted it to be nothing less than a spring, but they proved so hard to find we eventually settled on a borehole instead, where the water is as natural/ unpolluted/ and plentiful as possible. Also we wanted to be where there was at least one metre of rainfall per year, in order to be able to capture and store as much as that for non-drinking purposes. – high up. At +/- 600 metres. This is because the further you go the less extreme the climate becomes (all-year-round)/ humidity is lower/ pollution less/ but probably most important of all right now (with the imminent melting of both polar ice-caps and a subsequent 50m rise in sea-level), there’s absolutely no risk from flooding or tsunamis. – south-facing. Having tried all the other options this is undoubtedly the best. For crops/ minimising frost damage/ solar & wind power/ as well as being a lot warmer and lighter indoors. – with a soil that is as sandy as possible. All the others just make the job a lot harder. – where neighbours are as far away as possible. Which is not as easy as it sounds, for even with 2.5 hectares that’s still at best only 200 metres, unless like here you are surrounded by nothing but trees. – proximity to a local town was crucial as well, it had to be no further away than an easy walk/ cycle. And small, +/- 500 people. Almonaster la Real is perfect. While at the same time as far away as possible from any cities (Sevilla, the nearest, is 120 km). – well away from all roads and any other hazards to healthiness. – a climate where we can grow the widest range of crops all-year-round. 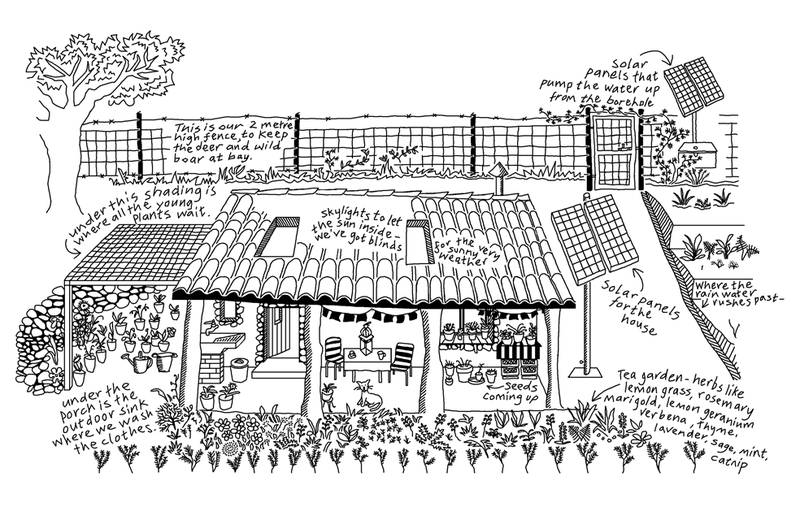 – where we could have the perfect house, the most practical/ healthy/ and inspirational living space possible. Sadly, in 2013 Maureen got sick, then suddenly was gone. But her vision for a more sustainable/ simpler/ healthier/ and creative life continued, and on the following pages you can see/ read all about that. Also included are some of the many influences/ ideas we came across over the years. I hope you enjoy dipping into them. Please feel free to ask questions, I am always happy to help in any way I can. Maureen dying like that was a terrible blow, we had been together for 35 years. Until this happens to you it is not possible to imagine the blow that causes. Basically you cease to exist as a person and the pain never gets any less. But thanks to my amazing family, that is the people Almonaster la Real (my local village), I have been able to keep going. Plus I have found a new partner too. She lives in Shetland, which is a whole other world to here, and I have decided to go there to be with her. Which basically means EP is for sale, and I would like that to be as soon as possible. For those interested the following pages pretty much describe everything. Ideally I would like a very energetic couple or small group/ community (say of up to six people), to take it over. It would also make a perfect animal sanctuary. But it could be anything to anyone. My original asking price was 130,000 euros, but as I now want to leave before the end of May this has now been dramatically reduced, dependant on how much of the conveyancing the buyer is prepared to take on. Have a read then send me an email (monkeyandsofia@yahoo.co.uk) or WhatsApp (+34 633 731 906) with any questions. Very briefly, El Pocito is situated in a very large area of forestry (pine/ sweet chestnut/ oak), approximately 182,000 hectares (the Sierra de Aracena). It contains: approximately 2.5 hectares of hillside/ a small off-grid house (42m2, which can be expanded) with solar power/ and its own water supply via a borehole. The site is south-west facing and sloping, at a height above sea-level of 600m. Access is via a 2km forestry track, after which it is 1km of highway to Almonaster la Real (where there are all the usual facilities, see the appropriate page for more details). Please note I do not have internet access at the house (by choice), so please be patient for a reply, it should be within 24hrs. Thanks also to Nacho Suárez Obel who provided many of the photos for this site. “There are only two solutions which will save us from imminent extinction. 1) An immediate global ban on all further births, until such time the total population is reduced to a sustainable level again (more on what that means in a moment). 2) A similar ban on the use of money, but permanently. And the reasons? Because this is the only way we can save the planet (and by implication, ourselves). That unique self-governing eco-system, composed of an ever-expanding number of interdependent species, created in such a way, so infinitesimally complex, that even all our collective brain-power and computer-resources could never even begin to guess how it functions. The sole provider of all the necessities we take for granted. From oxygen we need to breathe, water, food, fuel, in fact everything. Such an infinitely complex mechanism, that for us to tinker with any part of it is to court disaster. Which of course is exactly what we have been doing, for the last 10,000 years. Yet before that we were actually a positive and integral part of this wonderful creation. For three million years, 98% of our existence. We did this by acting sustainably. Which meant keeping our numbers to a pre-determined level (around 5 million), and not taking anything out of nature (be it species or materials) that could not be replaced with exactly the same. Then for some reason, 10,000 years ago, we decided to opt out of that. At first it didn’t seem to matter, but our destruction was exponential, each new day it was worse, until now a single minute creates more damage than a thousand years at the beginning. And there is so little left of the eco-system it is on the point of implosion. We are all about to die. Today, tomorrow, next week, next year. Nobody knows when exactly. But this is certain, it will happen soon. Children born today will not live to become adults. Sustainability is not rocket science. If we want a future we have to stop taking out, stop using money, stop multiplying. Which leaves just the one question, are you prepared to do that? Mucho Animo Phil, yo tambien busco gente para formar una ecoaldea y la verdad que me esta costando encontrar gente que se comprometa y que tenga las cosas claras para hacerlo. Hi Phil, stumbled onto your site and really enjoying browsing and reading up on what you have created. I am feeling: simplicity, harmony and beauty and the love of nature. What a wonderful project. I offer condoleances for the passing of your partner and all best wishes for the future of your lovely home, the evolution of your work and lifestyle and your own deeper fulfilment. I saw your ad in Permaculture Magazine so went to look at your site. . . I love the DVD you made showing your home and the garden. From 2003-2009 I lived in Andalucia with my ex partner. We bought some land with a ruin just outside Velez Rubio and eventually built a house there but we made the mistake of not being able to live in it sustainably. Eventually the relationship dissolved – things change and life moves on. I can understand your loneliness and devastation at the loss of your partner and admire your courage in sticking with your dream. Your vision is fantastic and I wish we could have swapped ideas and experiences with you at the time. Living in Spain had always been my dream and I never regret the opportunity I took to move there for those 6 years. Living back in the UK since 2009 and I’m fairly happy. For me Bristol – where I live – is like a halfway house between Spain and England as there are so many Spanish living here – but I do miss Andalucia (I won’t say “Spain” because it is so different to the rest of Spain) a great deal and especially the Spanish way of looking at things and living life. Good luck in your search for a soul mate and in your future wherever that may be. Really beautiful story and i shared your ad on my page facebook. Me and my friend are willing to live sustainable. We are at the moment saving money to buy a plot in spain or portugal. We will be visiting some regions of spain this september oktober in order to find our dream piece of land. Unfortunately we have a tight budget so we cant go for this one. But its really beautiful. I feel it’s time for me to follow my heart and take responsibility for a piece of land like el pocito. Can We get in touch? Maybe via mail adress? Thank you for sharing your thoughts and dreams. your living my dream, best luck for the future! Firstly sorry for your loss and secondly thank you for sharing your wonderful story with us all .. You are both an inspiration and I would really like to know more and come to visit with a view of continuing the beautiful history you have both created.. Thanks so much for your inspirational story. I’m planning on sharing it with my #PermacultureWalkabout network. I can across your site by pure chance and was captivated. I have since downloaded your late wife’s book and loving every page. Learning that your wife had passed away in 2013 was a real blow and I felt so deeply bereft for you. How you have managed to keep only you know but it looks like you are starting to live again and plan another chapter in your colourful life. I couldn’t be happier for you. I hope you will continue to share your life with people like me who are like minded in their quest for a simpler more sustainable life. We retired early to Turkey but for many reasons are now looking for another place and Northern Spain and Portugal were at the top of the list that is how I came across Elpocito. I see you are considering the French Pyrenees. The region looks beautiful and I look forward to hearing your story if you make it there or wherever. Good luck and keep writing it’s inspirational! Wish we could buy your property but my partner and i are looking for very cheap in Spain. I hope you find someone to buy and you can continue on your journey of life. Beautiful website and so informative………blessings to Phil and his ability to create from source …..Namaste…. I have read your blog and Maureen’s book. Your life in SW spain is inspirational and educational. What an achievement in an alternative sustainable lifestyle? You have my email address. Perhaps we can have a chat about your new endeavours. We are in Galicia at the moment. We lived on the Alpuharras for a short while back in 2014. We also have a straw bale house on a 1 ha of land back in Australia. May you find your next years as fulfilling,and continue to bring hopeful beauty into this world..sending you all good wishes,and thanking you and your wife for your wonderful work..